Arrive At Delhi Airport The Bustling Capital Of India. On Arrival Pick-Up From Airport And Transfer To Hotel For Check-In. Day Free For Own (Depending The Time Permitting). Overnight Stay At Hotel. 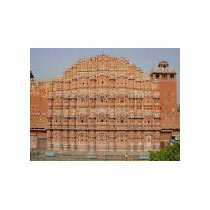 After Breakfast Proceed For Sightseeing Tour Covering Red Fort, Qutub Minar, Jama Masjid, India Gate, Humayun Tomb. Overnight Stay At Hotel. After Breakfast Drive To Jaipur. On Arrival Check-In At Hotel. Evening Visit Birla Mandir & Albert Hall. Overnight Stay At Hotel. After Breakfast Drive To Agra. En-Route Visits Fatehpur - Sikri. On Arrival Check-In At Hotel For Overnight Stay. After Breakfast Visit Taj Mahal (Closed On Friday), Red Fort. Later Drive And Drop At Delhi Airport For Onward Journey With A Bunch Of Enthralling & Ever Mesmerizing Moments During Your Tour.